Dr. Ives De Chazal is an experienced pulmonologist in Tucson, Arizona. He got his medical degree from Universidad Nacional de La Plata Faculty of Medicine and did a residency at Creighton University. He then did two fellowships one at Mayo School of Graduate Medical Education and one at University of Minnesota. Dr. Ives De Chazal ha 4 board certifications including sleep medicine and pulmonary disease. 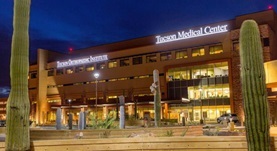 At the moment Dr. Ives De Chazal works with TMC Tucson Medical Center. Dr. Ives De Chazal has contributed to 4 publications. Delayed cardiogenic shock and acute lung injury after aneurysmal subarachnoid hemorrhage. Chazal, I., Parham, W. M., Liopyris, P., Wijdicks, E. F.; Anesth Analg. Novel aspects of pulmonary mechanics in intensive care. Chazal, I., Hubmayr, R. D.; Br J Anaesth. Iodine toxicity treated with hemodialysis and continuous venovenous hemodiafiltration. Kanakiriya, S., De Chazal, I., Nath, K. A., Haugen, E. N., Albright, R. C., Juncos, L. A.; Am J Kidney Dis. The sweet killer. Can you recognize the symptoms of ethylene glycol poisoning? Chazal, I., Houghton, B., Frock, J.; Postgrad Med.